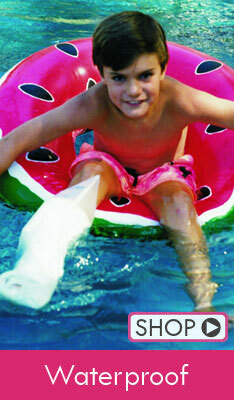 Cast Covers, Crutches & Accessories, Waterproof Products and More! 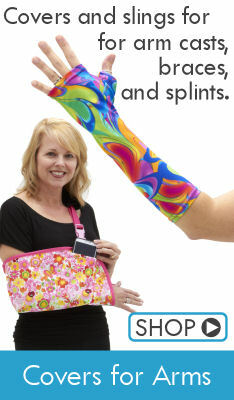 Founded by a mom with a daughter who has 9 broken bones, CastCoverz! understands your frustration, inconvenience, pain, and even worry. We are crazy about our customers and committed to helping you feel better, so you heal better. We are here to help you select the best cover and comfort products for you or your loved one's injury, condition, or surgery, offering our "We're here to help!" exceptional customer service guarantee so you are completely satisfied. CastCoverz! is the leading global manufacturer, e-tailer, and innovator of Made-in-the-USA essential orthopedic soft goods (brace, splint, boot, and cast covers), orthopedic accessories (crutches, CrutchWear®, EvenUp, waterproof products), and patient-requested orthopedic gear. 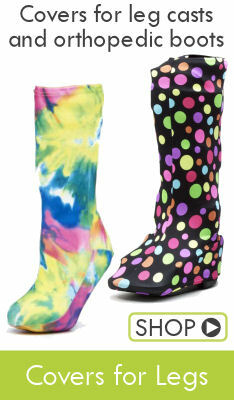 Cast covers stop the snagging and the scratches and give casts, braces, splints, crutches, and walking boots fashion, function, and FUN! Orthopedic gear includes waterproof cast covers for showering and swimming (AquaShieldUSA), CastCooler® to eliminate itch and smell, Broken Bones Club t-shirts and mugs, Designer Color Crutches and CrutchWear™ crutch accessories, and so much more! See Why Celebrities Love CastCoverz! Celebrities like Lori Greiner, Kelly Ripa, Tamara Monosoff, Dolvett Quince, Peggy Tanous and more! Click Here!